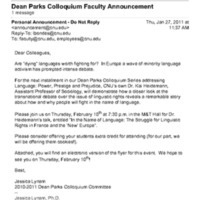 E-mail announcing Dr. Kinch's lecture at the 2002-03 Dean William Parks Colloquia. List of topics, dates, times and locations of speakers. 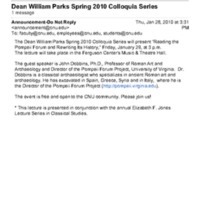 A flyer for a Dean William Parks Colloquia Series lecturer. 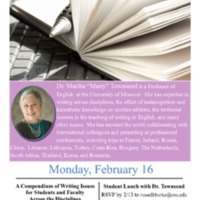 Flyer for Dean William Parks Colloquium Series speaker Clay Jenkins.